Terence Tao is a Professor at the Department of Mathematics, UCLA and one of Australia's most acclaimed mathematicians. Indeed, he is arguably the world's greatest living mathematician. In 2006, he was awarded a Fields Medal, which is the top prize a mathematician can win, and at 24 became the youngest ever full professor at UCLA. One of the interesting things about the primes is that there is no known formula yielding all of them - you can't simply plug a few numbers into a formula to generate a list of the primes. However, on a large scale, their distribution can be modelled. The primes behave as if they are distributed pseudorandomly - see the picture on the right. 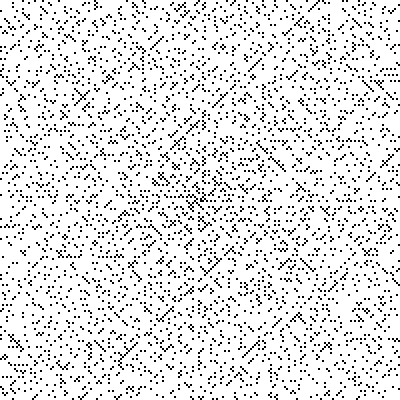 Each dot in this Ulam spiral represents a prime number - you start in the middle, and wind outwards like a spiral - each dot is a prime, whilst empty space is a non-prime. Whilst you can see various patterns, nothing is predictable. Primes are very important for public-key cryptography - that is, the way your credit card numbers are encrypted in online transactions. The cryptography makes use of the fact that is difficult to factorise large numbers into their prime factors, whilst it is comparatively easy to multiply two large primes together. No efficient integer factorisation algorithm is currently known - in 2005 a 193-digit number was factorised, but it took 5 months. Terence Tao, along with Ben Green, proved that the sequence of prime numbers contains arbitrarily long arithmetic progressions - this is the Green-Tao theorem. What this means is that for any number k, there is an arithmetic progression of primes k long. An arithmetic progression is one in which the difference between two numbers in the progression is the same. For example, the series 2, 4, 6, 8, 10... is an arithmetic progression with common difference 2. Green and Tao proved that such sequences exist within the primes for any length of series you want. For example, the series 3, 7, 11 is a prime sequence of length 3 with common difference 4. The series 3, 5, 7 is length 3 with common difference 2. The current record is a series of 25 primes. I have just finished reading the excellent book The Music of the Primes by British author Marcus du Sautoy - I highly recommend it. It details the story of the Riemann hypothesis which is considered by many to be the most important unresolved problem in mathematics. A solution to the Riemann hypothesis could make an immense contribution to our understanding of the distribution of prime numbers. You certainly don't need to be a maths geek to understand this book - it is a great historical tale. You can buy the book from Amazon here.